The concept of portable displays is not well know to a lot of people. However these kind of portable displays can come in pretty handy for a quick presentation to a small group of people without the hassle of setting up bulky projectors. They can also be used as muti display to expand your workspace. 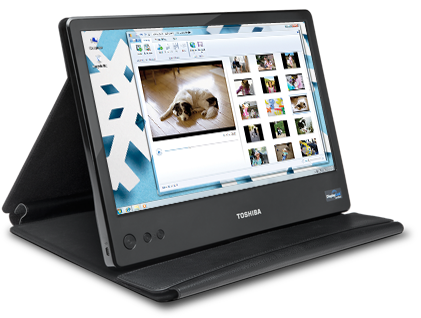 Toshiba recently unveiled a 14-inch USB-powered Mobile Monitor. This innovative technology has been made possible by display link technology which can be said to be the creator of this technology. The Toshiba display is designed to add an additional monitor to any Windows PC via just a USB slot for drawing both power and video signal. The display features a 14-inch diagonal widescreen with up to 1366x768 HD resolutions, it provides clear and crisp images similar to a laptop’s LCD. The display weighs in at just under 3 lbs which makes it quite portable for use almost anywhere a laptop can go. Talking about features, first of all its an innovative concept so its sure to catch people's attention and leave an impression if you are into sales and business. The screen is fixed to a leather carrying case which also doubles up as a stand. Its packs into a nice package and is pretty easy to carry. Over all the mobile screen is pretty good for professional and students who are involved into a lot of presentations and multitasking. Its a new concept and will become more popular over time.The Toshiba Mobile screen is Available at Toshiba US site for $199.99 which is a bit costly but its worth it if it really caters for your needs. Can serve a lot if you own or work with plug computers. Mercedes Benz F1 Suspended & Exploded display. What Apple iPad 2 holds?